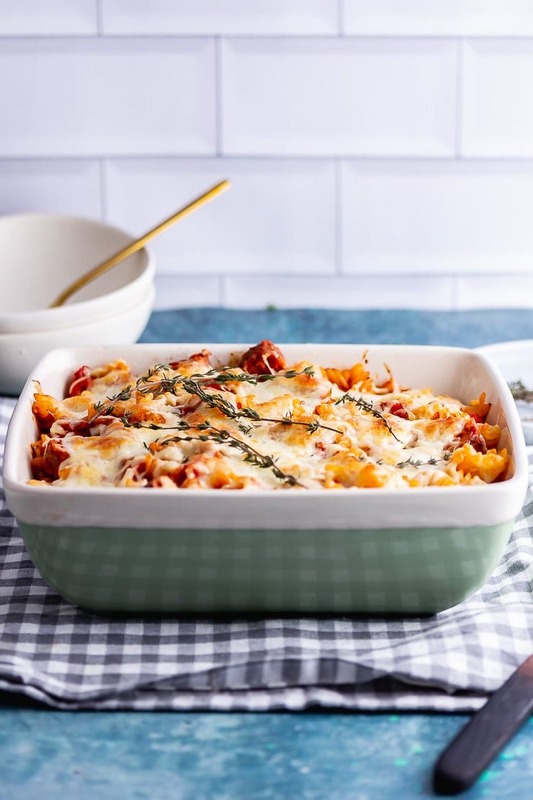 This pasta bake is such wonderful comfort food. Are we still allowed to be eating comfort food in April? I’m saying yes because after a faint glimmer of hope last weekend when I went out without a jacket (!) the weather here has dropped back down to miserable temperatures with no let up in sight. So we’re still going with comfort food until further notice. Since cutting back on meat we’ve been trying more and more dishes with vegetarian sausages replacing what would normally take up the meat portion of the dish. 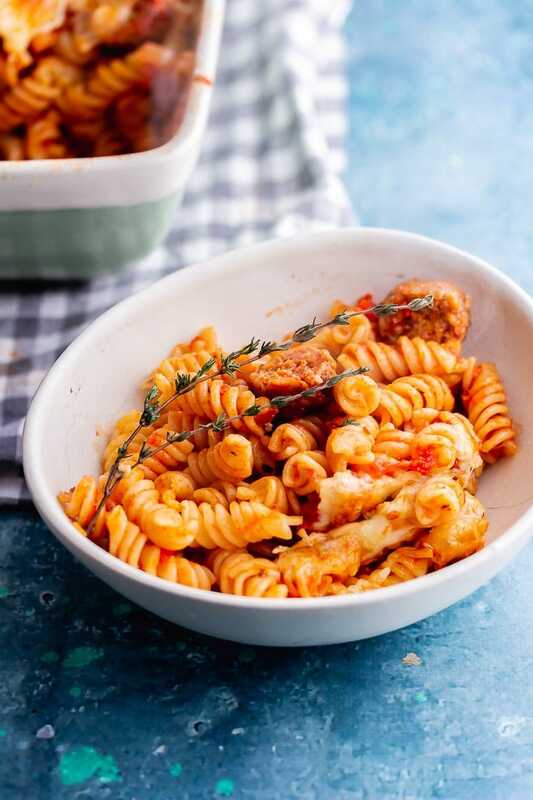 Whether it’s a classic like toad in the hole or a simple sausage bake that’s perfect for a quick brunch or dinner. 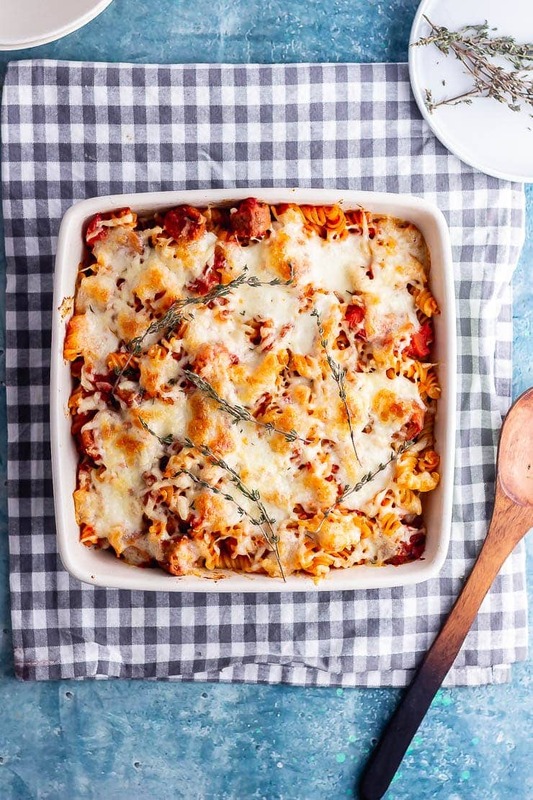 And now I’m making another classic with this sausage pasta bake! Make the sauce: Heat the olive oil, fry the onion then the garlic and the herbs. Pour in the chopped tomatoes and simmer until thickened. 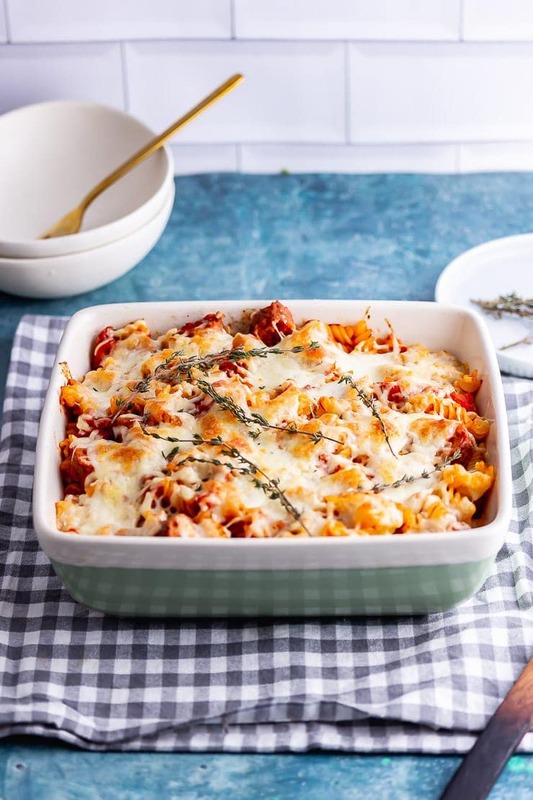 Make the pasta bake: Put the pasta, sauce and sausages in a baking dish, mix then top with the cheese and bake for 15 minutes until the cheese is browned. Heat the oven to 200°C/400°F. Cook the vegetarian sausages according to packet instructions. Slice and set aside. Put water on to boil for the pasta. 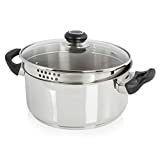 Heat the olive oil over a medium heat and add the onion, cook until softened then add the garlic and cook for another minute. Add the oregano, thyme and chopped tomatoes and bring to a boil. Simmer for 10 minutes until thickened. Add the pasta to the boiling water and cook for 10 minutes. 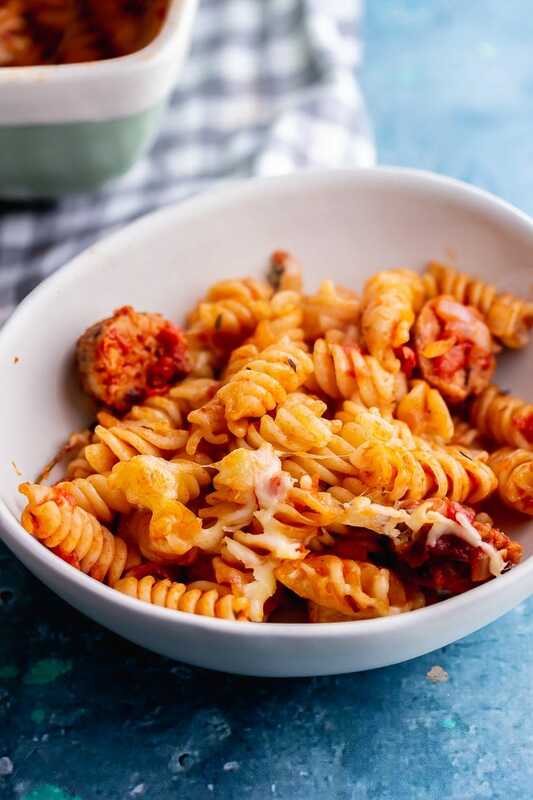 Drain the pasta and place in a baking dish with the vegetarian sausages, mix. 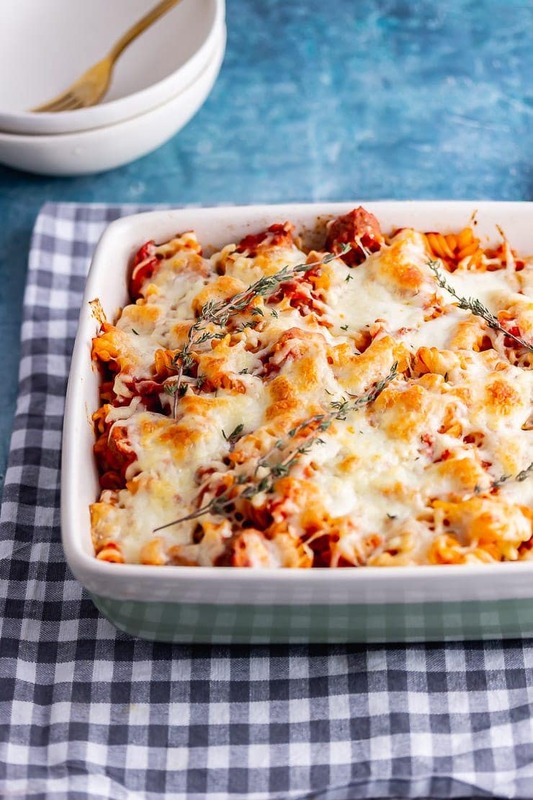 Pour over the tomato sauce and mix again, sprinkle over the cheddar and mozzarella. 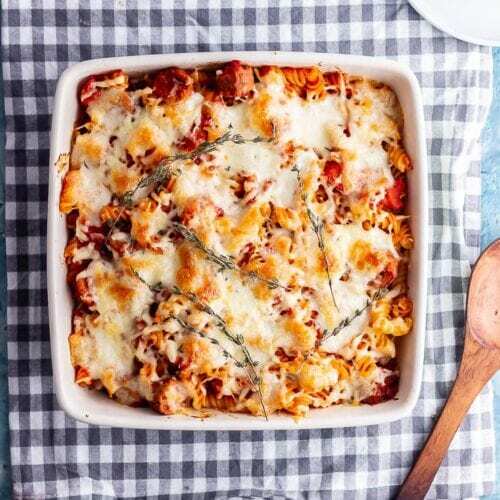 Place in the oven and cook until the cheese is melted and browned, about 15 minutes. 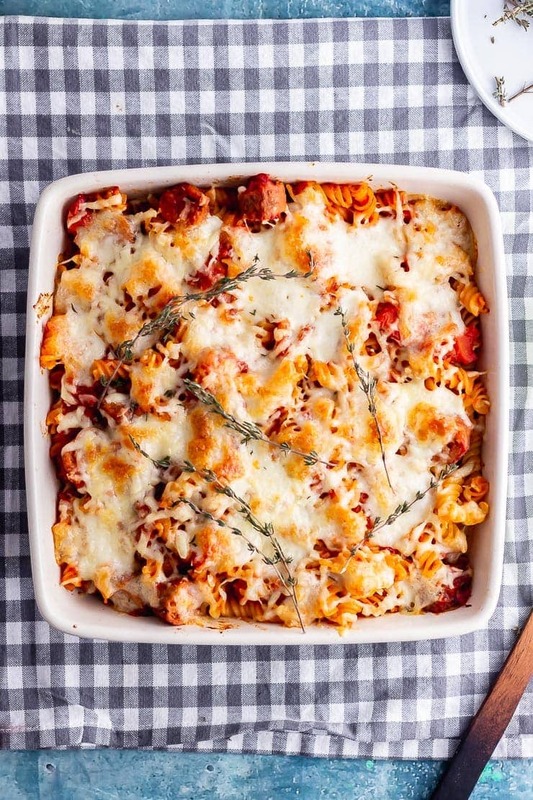 I’m a sucker for a pasta bake and I’m totally with you that we can still eat them in April! 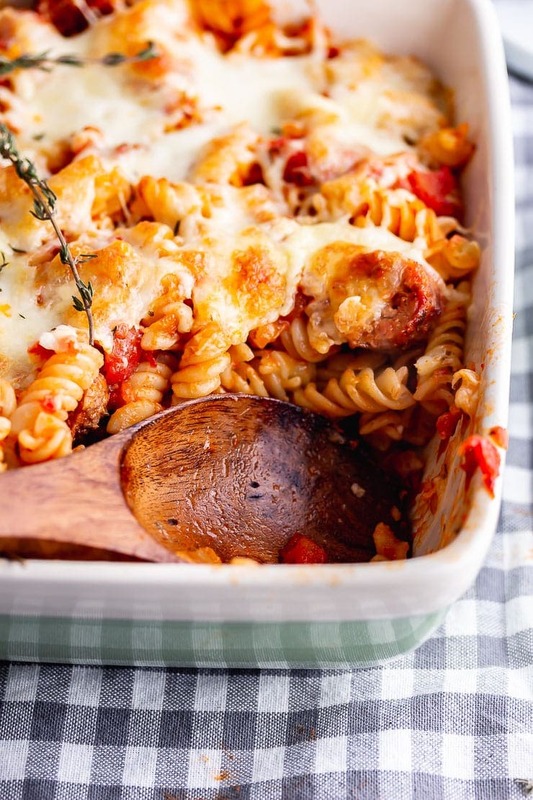 Sausage pasta bake is total comfort food. So many different things you can add in to it too. Um yes! 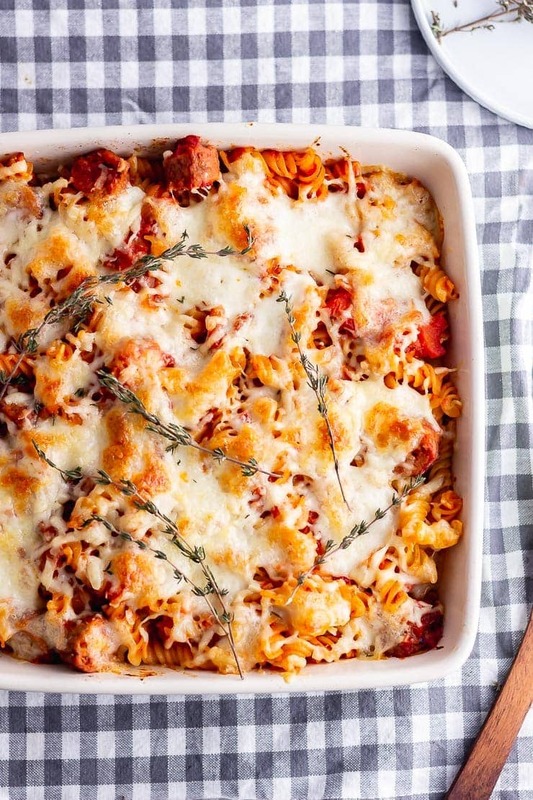 Comfort food is totally acceptable in April, and in May, June, July…etc. This looks amazing! 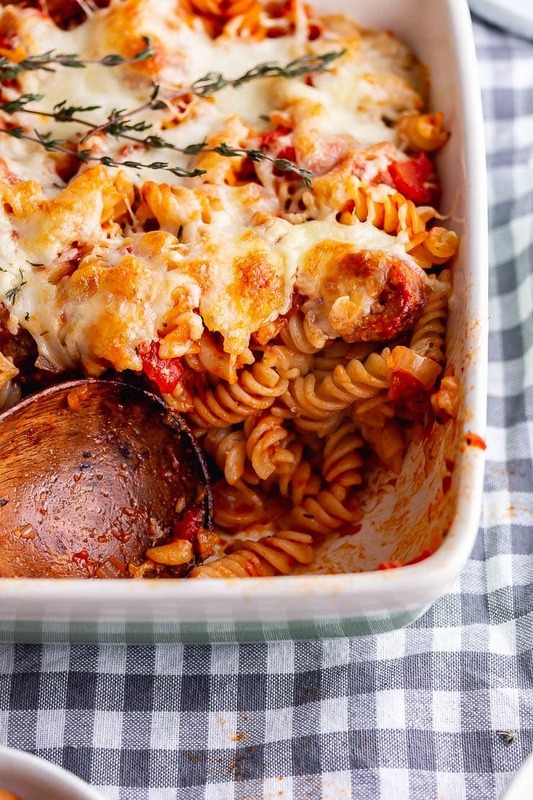 You can’t beat a tasty pasta bake for an easy to make mid-week meal. Great to make in advance and popular with everyone. 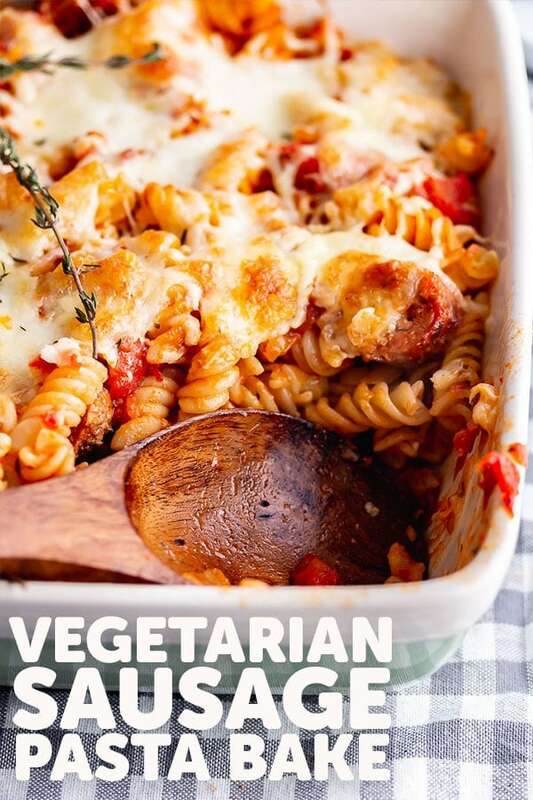 Nice idea to add the veggie sausages, they go really well together. 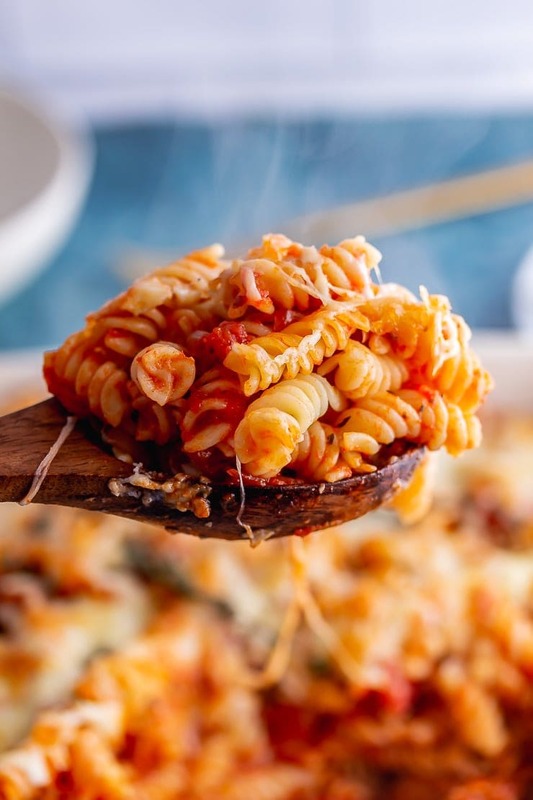 Anything pasta is totally a comfort food in our home, more so if it has cheese on it. This dish looks so good. I am definitely going to have to try it, both with regular sausage and vegetarian sausage.